From where I stood to take this photo, it almost looks like the middle of an endless forest of skyscrapers. 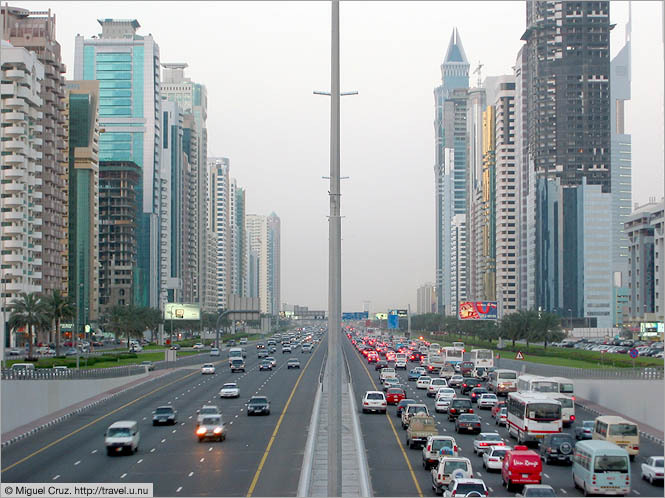 In fact, though, the two rows of towers lining this 3km stretch of Sheikh Zayed Road stand alone, surrounded by desert and small two-storey concrete buildings. It's very eerie and unnatural-feeling, and apparently I'm not the only one who feels this way: When I took a taxi from Deira to the camel track outside of town, we passed down this way and my driver lamented the gleaming sterility of it all. From the number of white faces I saw as compared with elsewhere in town, it appears that this - along with the airport and the beach - is all many tourists ever see of Dubai. Quite a shame. Though it goes a long way towards explaining the city's unfounded reputation as nothing more than a collection of modern upscale shopping malls.